Anna kept a journal during her time on the job. The daily entries describe the expansive landscape and weather, her students, and the tasks at hand. Twenty-one-year-old Anna Webber rubbed her eyes and leaned against the rough wall of the sod schoolhouse where she taught. The view from the window of the small building framed the tall grass and wheat fields around Blue Hill, Kansas, perfectly. A slight breeze in the middle distance brushed across the tops of cottonwood trees lining the banks of the Solomon River, richly adding to the peaceful scene. Anna squinted into the sunlight filtering into the tiny classroom and stretched her arms over her head. The one-room schoolhouse was empty of students, and the young teacher was sitting on the floor grading papers. The room was only big enough for a half a dozen pupils but served more than sixteen children on most days. Inside the roughly constructed building, made from strips cut from the prairie earth found in abundance around the small settlement, the furnishings consisted of a chair for the teacher and several boards balanced on rocks for the students to sit on. 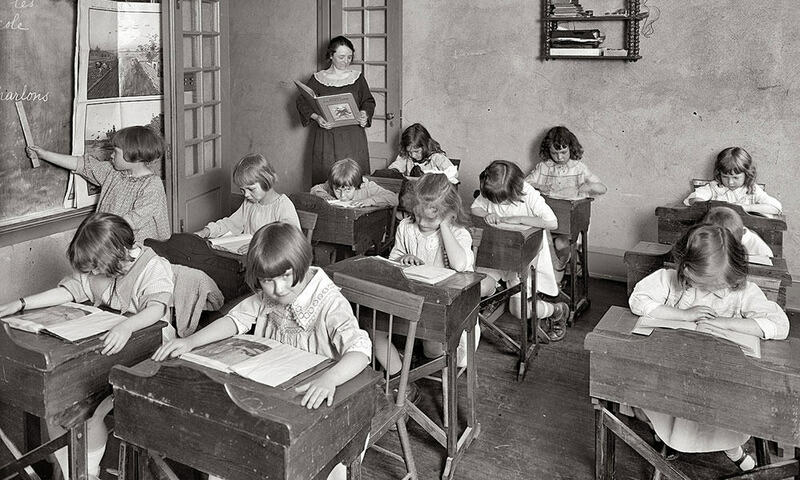 There was no blackboard and no writing desks. The primitive conditions made Anna’s job more difficult than she had anticipated and robbed her of the joy she initially felt when she entered the profession. The town in Mitchell County, Kansas, where Anna held her first teaching assignment in 1881, was a growing community of farmers and railroad workers. Five years before her arrival, the area had been ravaged by hordes of grasshoppers. The insects destroyed crops and drove settlers away for a time. The ever-advancing railroad brought many back to the fertile ground to raise corn, wheat, and rye. Anna’s family was among the people who returned to the region to start life anew. Anna Webber was born in Breckenridge, Kansas, on September 16, 1860. Her parents, William Ellsworth and Thankful Delila Webber, relocated to Iowa shortly after she arrived and remained there until Thankful’s untimely death in 1872. Anna’s father remarried and moved his new wife and children back to Kansas the following year. Little is known of Anna’s youth. Historical records note that she attended school in Mitchell County and in the spring of 1881 took and passed her teacher’s examination. Eleven boys and five girls were enrolled when Anna began her first day at Blue Hill School. The students ranged in age from six to thirteen years, and the school term was three month long. Monday, May 9, 1881. Well, here I am at my first school. I realy [sic] wander if I’ll like it. I arrived at the house about eight o’clock. It is a very pleasant looking place. I wander how I’ll get along. My anticipations are great-I am going to try to make rapid improvement. I hope the next three months will not be lost. And I trust they will not be if I continue with the effort I’ve been made today. There is something in which I am bound to improve, and that is in speaking low (tho it is natural for me, as it is to see). The Supt gave me such a desperate look while I was reading at the examination, that I resolved to “learn to read aloud.” I think if hollowing [sic] will do any good I’ll overcome that fault entirely. I have a scholar that is some deaf, and I’ve “hollered” and talking today until my throat aches. I am among entire strangers, not knowing before I came here a single person. Thursday, May 12. It has been dark and cloudy, but cool and suitable to study. I am getting along splendidly. Now if I only had seats and a black board, it would be so nice. I know I am improving, and think the scholars are. I have not such a school as I wanted, but I’ll do the best I can. Well I’ll have to go down and get Mrs. McPeak’s broom and sweep the school-house. Friday, May 20, 1881. O, Dear! Almost two weeks of my school gone. And how do I like teaching by this time? Well, I hardly know. I think I like it. I know I would like it better if things were different. As it is I do not make the progress I had [expected] to. About all I learn is in studying after school is out. And then I am so tired and fidgety, I can do nothing scarcely, unless it is to walk about, or go to sleep, perhaps that will wear off tho’ as I get more used to teaching. If I only had large scholars that were farther advanced, I would like it. But I haven’t so I’ll have to make the best of it. If I can get to Beloit I will get me a grammar, and some kind of writing system. But I am so far from town that I don’t expect to get there until after school is out. You can’t get your mail here, or get a letter to the office – any to often. I have a letter now I should like to send to the office, but I guess that is all the good it will do me. And I want some ink, yes and something to write on. Before I began school I thought I would write an Essay every day, and I haven’t written one yet, – but I must try, it will be a failure I expect, but I can’t do more than fail though. I guess I’ll take Nature as the subject. It seems as if there is enough to write on that. I am surrounded by nature, and about all I see is the hills, and all I hear is the noise of the birds, and a dozen or more of children. Tuesday, May 24. I have had rather a dull school today, or it seems that way to me. Perhaps it is because I have had so much trouble with Charlie A. It seems impossibility [sic] for him to learn the alphabet. He is such a careless, lazy little rascal. He seems to take no interest whatever in trying to learn. I don’t know what to do with him. A little boy came to visit our school this afternoon. I do wish those seats would come! They are not going after them now until they get their corn planted. Then perhaps it will be, “not till after harvest,” and I wouldn’t wonder if by that time it would be “Let’s build a good house first.” Nothing extraordinary has happened in school today. Monday, May 30, 1881. School-day has arrived again. And I have six new scholars. It makes my school nearly twice as before. But the best is they have brought a table for us to use. They did not get the seats Friday. The table makes it seems like a different place. I feel tired tonight, something like I did the evening after my first day’s experience. I was very busy this forenoon. So busy that I did not have spare time to turn around in. Did not get through until a quarter past twelve, but got things so I [will] not be in a “rush” this afternoon. I spent a disagreeable day pleasantly yesterday. I wrote a letter to Nellie in the forenoon, and spent the afternoon in reading. I did intend to attend Quarterly Meeting, but it rained so as to make that impossible. Saturday I had laid off as a day of general study. But I studied very little, I did a little sewing, and that was about all I did do. Saturday, June 4, 1881. I am teaching today. I have only eight scholars. The wind is blowing real hard, and it is quite warm. Bro. Birch called on us this morning. I feel to mean for any use today. I believe I have not studied a bit today. Just the minute I sit down I go to sleep. I have a dull, dizzy head-ache, I don’t know whether it is sickness, or pure laziness. I wonder where I will be one month from today. I have to go down and iron this evening. Wednesday, June 8. It is nearly sundown. I have been writing for an hour and a half. I am nearly starved. I had the misfortune to have to keep a scholar after school today. The little chap blacked his face in school-time, and made a real jubilee – I don’t like to punish a pupil, and I have very little of it to do. They all try to do right. And study well. Once in a while one of them takes a contrary spell, but they soon get over it and are as good as can be. And I did go, not waiting even to straighten the schoolhouse. [One sheet of the diary is missing.] had a pleasant time. The pupils have had pretty good lessons, and been quiet. Frank B. came, but has been real sick, he looks bad. There are so many little funny things happen in school. I cannot keep from laughing, sometimes when I know I ought not to. I do wish I could take music lessons, if I had money I would take them. It is like school teaching. I always wanted to teach, and wanted to learn music, but I am afraid like the school-teaching, it will be so long before I get the opportunity, and I will have been so often disgusted, and out of patients with my efforts, that when the time comes (if it ever does,) it will have lost half the charms. Tuesday, June 21. Another day of school has gone, Another rather hard one, to [sic]. I cannot think of any thing to write. I have not got entirely over my chagrin yet. Nothing unusual has happened in school today. We had a nice rain last night, that cooled the atmosphere and made it more pleasant for studying. There was a real wind storm and I expected the schoolhouse would be among the missing, but it was not. Wednesday, June 22. Today finishes the seventh week of my school. There are five more yet. It is getting monotonous. not the school, but the surroundings, just the same quietness, seeing the same objects, and going through the same performances day after day, with no merriment or changes mix in it. How I dread to see the fourth come. I don’t know whether I’ll get to go home, or have to stay here, or get to go any place. I don’t believe it does any good to think of it, things go about as they please in spite of me. Nothing has happened in school today. Thursday, July 7. My, Land! The wind blows hard enough to take a persons [sic] head off. I’ll declare if I don’t just dread these hot windy day [s]. We have had to keep the door shut most of the time today. I have only nine scholars now. The children are playing, and shake the house till I can’t make a straight mark. Saturday, July 16. There is only nine days more of school. It seems a long time since I left home, but it does not seem like I had taught nearly three months. The school-house looks so nice that I hate to leave it. Well I have to go down and iron, or else make out the teacher’s report, this evening. I have had a pretty good school today. Friday, July 22. I have only four days more of school. It is cool and pleasant this morning. I am sorry school is so near out. Well I have to scrub the floor this evening, for there is preaching here Sunday. And I have to iron, and get ready for the picnic tomorrow. I had a nice school this forenoon, but it was not so pleasant this afternoon. I had to keep two scholars this evening, and that is not all I did for them, the little rascals. Well, if I don’t hurry faster I won’t get half my work done. Wednesday, July 27, 1881. HALF PAST SEVEN A.M. This is the day. It don’t seem that it is tho’. It don’t seem like there is anything unusual about it. it seems like a dark cloudy rainy school-day, and that is all. HALF PAST FIVE, P.M. My school is out. It is all over and done with. And I am just a little glad, and considerable tired. I have been dreading it so long. It was not so hard after all. But there was not many here. That made the difference. It was so “rainy” that they feared to come. We had a pretty nice time. But I cannot enjoy myself, or be lively now, it makes little difference where I am. I am going home tomorrow, and next week to school. Well school is out, I can think of nothing but I should like to write more but have not time. Goodby old Diary. Anna Webber continued to teach school in Blue Hills and two additional Kansas counties throughout the 1880s. She joined the staff of the Kansas Industrial School in June 1890 and was the head of the sewing department. That same year she met Robert H. Gravatt, and the two were married on February 5, 1891. Their daughter Lila followed in her mother’s footsteps and became a prominent teacher of American history at Lincoln High School in Nebraska.